GPS Navigation Systems / By Arun Kumar (PowercutIN) / Learning About GPS - What is GPS? How GPS Works? What GPS Can Do For You? To understand the sensitivity factor of GPS devices, you need to know how GPS functions. A GPS device contains a small GNSS receptor that receives signals from three or more satellites to provide proper accuracy of the GPS. These signals are sent from the GNSS network in the form of radio signals that degrade in strength as they pass through the different layers of atmosphere. Although the technology has progressed much to retain enough signal strength so that the GNSS receiver inside the GPS can interpret them and offer you with the desired information, there is still a good scope for the signals to become so weak that the receiver inside your GPS device fails to deliver accurate results. The commercial competition among the different GPS companies has initiated a focused research on developing algorithms that help improve the GPS satellite detection sensitivity. Although each company has its own research lab, the common aim of all research is to increase the GPS receiver’s sensitivity in comparison to existing signal acquisition and signal tracking sensitivity. 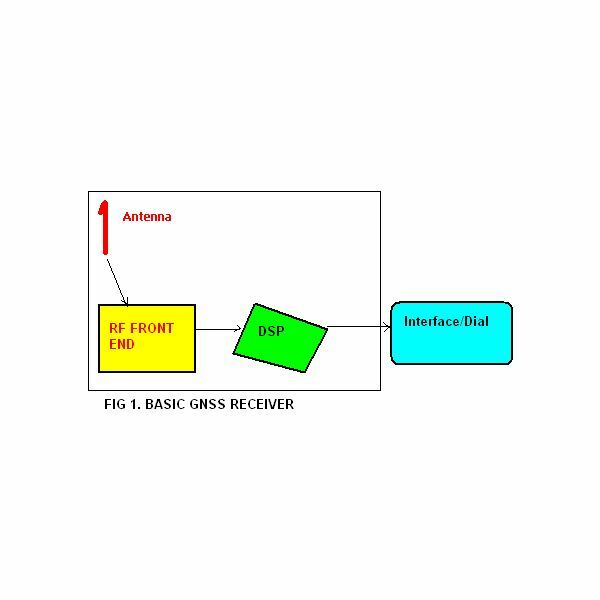 The following sections offer a look at the different components of the GPS receiver that can be worked upon to achieve greater GPS satellite detection sensitivity. A GPS receiver contains two basic components: the RF Front End and the Digital Signal Processor (DSP). The analog signal is first received by the RF Front End where it is digitized and sent to the DSP for processing. The DSP is responsible for computing and presenting the results as required. As these two are the main components, they form a major focus of GPS satellite detection research. The research for better GPS sensitivity aims to fine tune these two components so as to obtain maximum accuracy of the GPS device for the weakest signal. The RF Front End contains five elements that can be manipulated to achieve better sensitivity: Low Noise Amplifier, Filters, Down Convertor, Clock, and the RF Circuit Layout. The Low Noise Amplifier (LNA) is responsible for reducing the internal noise in the GPS receiver. LNAs available as standalone chips are more effective than the ones integrated into the RF Front End Circuit. Hence, the first step towards better GPS satellite detection sensitivity is to select an LNA based on its gain factor. Filters are used to weed out unwanted noise in the RF Front End. As the signal passes through the Filters, the unwanted noise is cut off (based on the L1 signal frequency [pass band = 2 to 20 MHz] available to the general public against the L2 available only to military). For higher frequencies, the normal LC filters are okay. If the L1 used by GPS provider is lower, SAW filters are better. In any case, the manufacturers need to make sure that these filters do not create any loss of important information while trying to filter off the noise. The Down Convertor has to divide the signals into lower intermediate frequencies before sending them to the DSP. It determines the signal processing parts of the DSP. Also, the Filters in the RF Front End are dependent on the Down Convertor. Hence, it should be selected carefully. The output from the Down Convertor is also an important factor that determines the GPS satellite detection sensitivity. A two bit output offers more GPS sensitivity than a single bit output. The Clock inside the RF Front End also plays an important role in increasing the GPS satellite detection sensitivity. Other than clock errors, the GPS device manufacturer should also make sure that the clock offers fewer jitters and is highly stable. An unstable clock will contribute to Doppler thereby highly altering the GPS sensitivity. Finally, the overall circuit of the RF Front End has to be considered. As the circuit deals with both analog and digital signals, ample care must be taken to ensure that none of the signal affects the other. Similarly, while creating parallel paths, there must be sufficient gap to avoid interference. Considering the size of GPS devices, it is slightly hard to find ample space, but a properly researched design can reduce interference of signals to protect and offer greater GPS sensitivity. The DSP is the computing part of the GPS device. Once it receives signals in the form of intermediate frequencies, it processes the data being carried over the signals to offer the desired information. Cheaper GPS devices carry software based DSP instead of ASIC (Application Specific Integrated Circuit) based DSP. The ASIC based DPS has lower error factors for sensitivity and offers enhanced accuracy of GPS. Software based computing has higher probability of errors due to thermal noise that leads to reduced GPS sensitivity. Besides, it depends on the GPS designers/researchers who determine what kind of loops to incorporate into the DPS to further eliminate noise while boosting signals. There are already plenty of algorithms in use that help in increasing the GPS satellite detection sensitivity. Research is on—among GPS competitors, at war-level—for designing better algorithms for greater GPS sensitivity and enhanced accuracy of GPS. The GPS satellite detection sensitivity can be enhanced using highly stable clock with an intelligent circuit board (in the RF Front) and better algorithms (code or programs) in the DSP. Fine tuning the other factors mentioned in this article can further enhance the accuracy of GPS device by way of increasing the GPS sensitivity. This series on GPS aims to offer you details on the essentials of GPS. It covers the GPS signal strength, measuring GPS accuracy, and factors that affect the GPS accuracy. Check these articles and feel free to ask further information on essentials of GPS.